In the spirit of Halloween, I am sharing about this children’s book today. Though not ‘scary’, young kids will love this one! Why did the class not feel well? Read the book to find out. 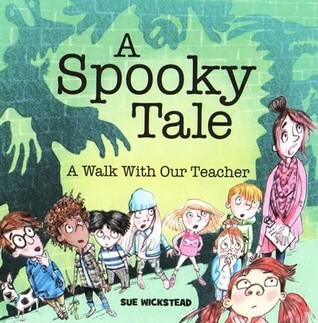 A fictional tale based on a real class walk around the neighbourhood. Where would your walk take you? This short picture book is one that younger kids will love. They will quickly turn the pages to see what the class runs into next! I found myself wondering what creature they will meet in their walk. It is a fun, quick to read picture book, but not scary at all. The illustrations are very well done. I read this on a kindle paperwhite, so I didn’t get to experience the pictures in color. I can imagine how bright they are in color. Do yourself a favor and buy your young kids this one; they will surely enjoy it! When my two children were young, they attended a playgroup on such a bus and as a volunteer I became involved with the committee running the project. The bus really got into my blood and became a work of the heart. I ended up painting the bus as well as working in the groups and raising the profile of the project and its work. As part of the committee and later as a play-worker, I was involved in raising necessary funds to replace the old bus with a newer project. It really was a fun journey to be involved in. 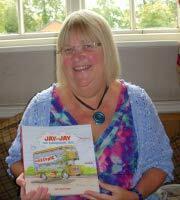 I taught in the local school for over 20 years but during this time I remained involved with all aspects of the playbus project in my spare time, assisting in fund-raising events, as well as working voluntarily in after school play clubs and holiday play schemes. I left teaching to write the history book about the original bus. I now work as a supply cover teacher and have been able to tell the many children I meet and teach about the bus as well as show them the photograph. The children were always curious and asked lots of questions about the playbus. This led to me telling a story which I eventually wrote down. Jay-Jay is the fictional story to go with the factual project.